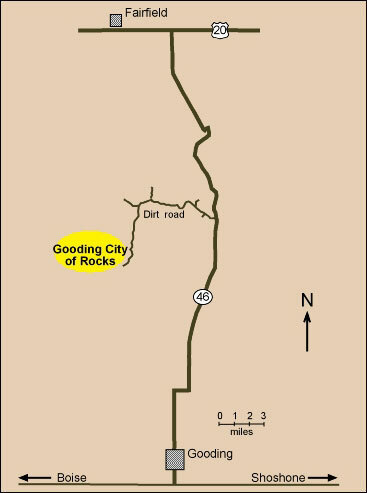 The Gooding City of Rocks is situated in the Mt. Bennett Hills about ten miles northwest of the city of Gooding, Idaho. The Bennett Hills form an eastwest-trending range of rounded hills which rise some 1600 feet above the surrounding Snake River Plain. Elevations in the area range from 4400 feet at the south edge to 6200 feet on the north. Drainages in the area include Fourmile Creek on the east, and to the west, Coyote, Dry, Cottonwood, and Clover Creeks. The Mt. Bennett Hills are located on the northern edge of the Snake River Plain in an area where the Cenozoic volcanic rocks overlap the Idaho Batholith. The hills consist of a horst (an uplifted block of the earth's crust) bounded by the Camas Prairie graben (a depression) on the north and the Snake River Plain downwarp to the south. They are made up of a sequence of volcanic rocks of Miocene age which have been intruded by rhyolites of Pliocene age. The hills rise abruptly out of the Snake River Plain along east-west-trending faults and then dip gently south to plunge beneath the Snake River Plain basalts. The major landforms making up the City of Rocks are highly-dissected plateaus with deeply eroded and deeply cut stream channels. The many streams and their tributaries, even though many flow only in the spring of the year, have helped dissect the volcanic rocks into weird and exotic forms. These spectacular landforms occur primarily in a geologic formation known as the City of Rocks Tuff, a member of the larger Idavada Group. A tuff is a fine grained rock formed mainly of glass particles in which crystals of feldspar, quartz and other minerals are imbedded. The deposits are believed to have been produced by the eruption of dense clouds of glowing volcanic glass in a semi-molten state. As the material fell to the ground the glass particles were welded and fused together. Many layers are solely composed of glass and obsidian (volcanic glass) formed within the welded tuff formation. Early man prized obsidian for the making of arrow and spear points as well as tools and ceremonial devices. Obsidian chips resulting from the manufacture of these items can be found scattered throughout the Bennett Hills, and especially at sites where early man found obsidian weathering out of the tuffs. The many pillars and arches in this tuff are a result of two forces- structural deformation and mechanical erosion. Weathering processes such as freezing and thawing have sculpted the rocks along multidirectional joint patterns (natural fractures in the rocks) to create a myriad of exotic features. For instance, closely-spaced horizontal joints make some columns appear like stacks of coins, whereas converging horizontal and vertical joints create weak points which are typically weathered to form concave features. Creation of the concave features such as undercut pillars, mushroom caps, and arches are also products of the weathering process. Alternating hard and soft layers in the rocks allow differential weathering and erosion to further shape the surface.In some locations within the City of Rocks, major northwest-southeast-trending joints can be seen to form "fins" of rock oriented in the direction of those joints. The fins and other geologic features in the City of Rocks are quite similar to those found in the Arches National Monument in Utah. Some of the more unusual landforms found within the area are columns, arches, monoliths, and especially hoodoos. A hoodoo is a rock formation that originates in the following way: rocks are fractured during periods of faulting; water then penetrates the cracks and causes them to widen. This leaves a pillar of rock separated from the parent rock. The alternating hard and soft layers of the tuff give an undulating or wavy appearance to the hoodoo. These features are common in volcanic areas and are usually concentrated in regions where most of the rain fall occurs during a short period of the year. An interesting mineral called diatomite is found on the western edge of the City of Rocks. The mineral, which resembles chalk, is made up of the skeletons of millions of single cell plants called diatoms. These planktonic drifters lived in great shallow inland lakes which covered portions of the Snake River Plain during the Pleistocene Epoch. As they died, their skeletons accumulated by the billions until deposits were formed which contained thousands of tons of mineable diatomite. The City of Rocks diatomite deposits are among the largest in the world. Recent studies on the origin of the Camas Prairie indicate that it is a downwarped block or graben which occupied a structurally weak geologic transition zone between the Snake River Plain volcanics and the Idaho Batholith. It is thought that the surface of the present day Camas Prairie was originally at the same level as the top of the present day Bennett Hills. Faulting along the northern margin of the Bennett Hills and the southern margin of the Soldier Mountain foothills caused the block to drop, creating the present day Camas Prairie. It was subsequently filled with sediments and volcanic rocks probably to depths of several thousand feet. Evidence of the faulting on the northern margin of the prairie can be seen in the many hot springs that surface along the fault zone. Additional evidence of major faulting is found in the north face of the Bennett Hills which appears to be a large escarpment (steep face which abruptly terminates the hills) with a number of major faults running parallel to it. Before the faulting and the downdrop of the Camas Prairie block, drainage off the Soldier Mountains ran across the block and down the south face of the Bennett Hills. These drainages brought in rocks which are not naturally found in the Bennett Hills and could only have been derived from the mountains to the north. A large deposit of these gravels has been mined near the junction of the City of Rocks road with Highway 46. It is interesting to examine the rocks in this deposit and compare them with those occurring in the Bennett Hills today. When the Bennett Hills were connected to the High Soldier Mountains a large drainage field was created whose outlet would have been the south face of the Bennett Hills. This would explain the deeply eroded and incised drainages in the south face of Bennett Hills, especially considering how difficult it would have been to create these features without the addition of a tremendous amount of runoff.